Pop music is still a young art form but as the first generation of rock’n’rollers — Chuck Berry and Little Richard — reach their twilight years, we need pop stars to address the realities of getting older. Thank God, then, for the Pet Shop Boys. Invisible, from their forthcoming album, Elysium, is a downbeat acceptance of the way that, after a certain age, you no longer attract interested glances from strangers. “After being for so many years, the life and soul of the party, it’s weird. 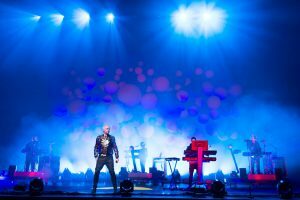 I’m invisible,” sings Neil Tennant in a semi-whisper, over Chris Lowe’s subdued synthetic beats. “Am I tragic or a joke, wrapped in my invisibility cloak?” You can imagine Tennant surrounded by the young and the beautiful, asking himself that question as he stands at the bar, alone, or isolated backstage at the Closing Ceremony of the Olympics (where they are tipped to perform tomorrow alongside young Ed Sheeran and One Direction). Invisible is a dignified song, approaching a subject head on in the way a novelist or playwright would, rather than perpetuating the myth of endless youth as so many elder pop stars do. The song is going through my head as I head over to a record company office in West London to meet Neil Tennant, 58, and Chris Lowe, 52, who, since forming the Pet Shops Boys in 1981, have sold more than 100 million records: honesty and intelligence in pop clearly doesn’t have to be a bar to commercial success. Tennant is as wry and as friendly as you would expect, while Lowe, the man who stands impassively behind keyboards in concerts while Tennant connects with the crowd, is quieter, more sardonic. There’s always the feeling that their entire career in music, right down to Lowe’s fondness for adolescent rave wear, is all part of a massive joke between the two of them although, with Elysium, they have turned the joke in on themselves. Your Early Stuff, for example, is composed of remarks made to Tennant by cab drivers. “Apart from when they think you’re Holly Johnson,” adds Chris Lowe, from the leather sofa he is slouched in. They certainly don’t want human imperfection to come along and ruin a Pet Shop Boys’ concert. When they started out, Tennant and Lowe were unusual in making a virtue of hardly playing anything live. This allows them to turn concerts into performance art pieces: their recent Pandemonium tour featured a box theme complete with box-headed dancers, a wall of boxes that fell down and was then built up into various shapes, and even a soap opera-style fight between two box-headed lovers for the song, Jealousy. Now it’s commonplace for pop concerts to be preprogrammed. The Pet Shop Boys were the first band to celebrate what had previously been viewed as unacceptable fakery. “You’re hardly Bruce Springsteen,” says Lowe, in a tone that suggests he intends this as a compliment. You would think that being a pop star would eradicate the journalistic voice, as it’s hard to remain observational once you’ve joined the party. A song from Elysium called Ego Music, however, skewers the self-obsession of most modern pop stars, with Tennant reciting in a deadpan fashion: “What can I tell you? I’m an artist. It’s humbling”, which is exactly the kind of thing pop stars say on a daily basis. Tennant is a pop star. How does he retain a degree of objectivity to his situation? I have a suggestion for them. There is a song on Elysium called Give it a Go. It sounds like a theme tune for a television series yet to be made. Have they ever thought of presenting a show about making things happen for kids, and calling it Give it a Go with the Pet Shop Boys?